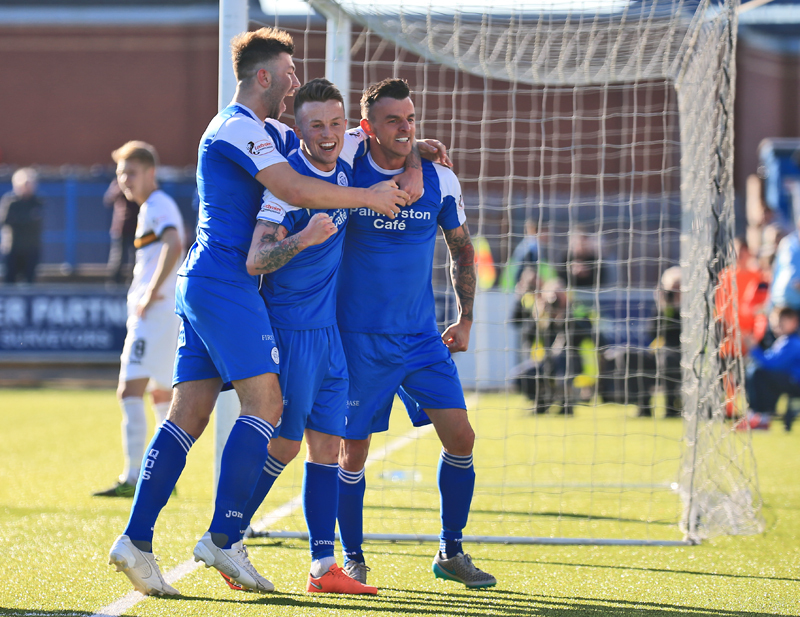 Queens ended their recent run of poor results by hitting Dumbarton for Six in today`s Championship clash at sunny Palmerston. 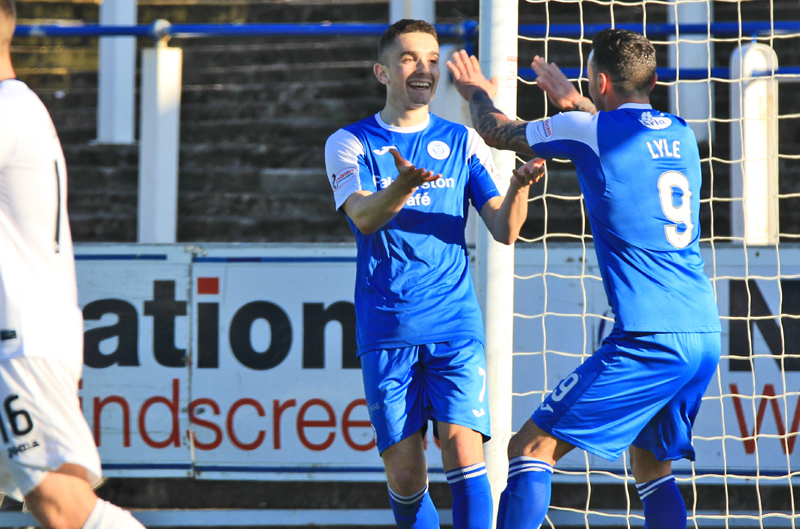 It was the first time Queens had scored 6 goals in a game since they clinched the Division 2 title against Brechin back in the 2012/13 season, and the home side missed numerous other chances on a day when they could possibly have netted double figures. 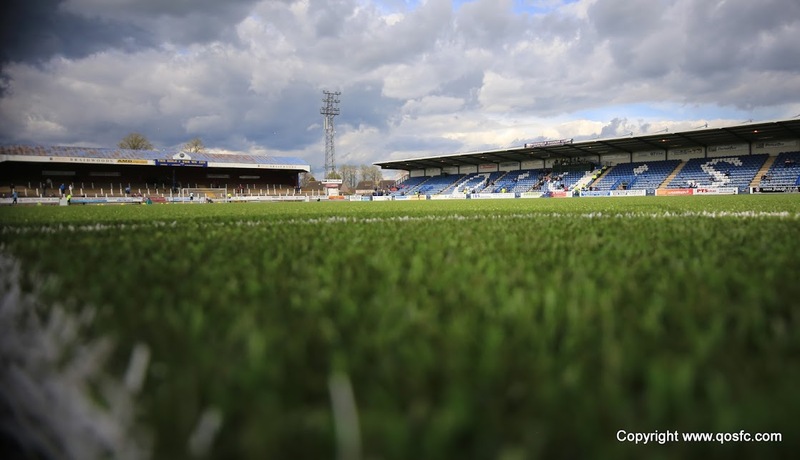 Two goals ahead at the interval, Queens scored three times in a 21 minute spell during the second period which completely ended any chance of a comeback from the visitors, before Iain Russell completed the rout with the sixth and final goal late on. 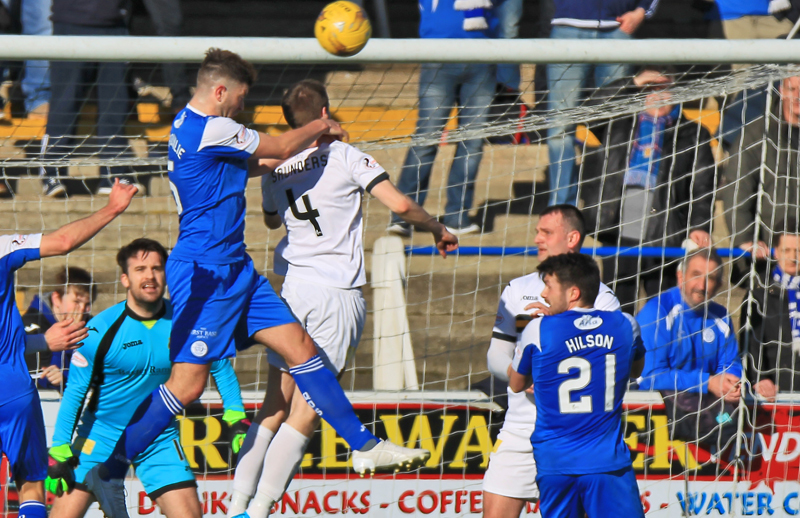 Returning to Palmerston after three away - and ultimately disappointing - games, Queens lined up in an attacking 4-4-2 formation making 2 changes to the team that started against Morton on Tuesday. Calum Tapping, and Alex Harris came in for Andy Dowie, and Jake Pickard, whilst Rangers loanee, Andy Murdoch occupied a rather unfamiliar right-back position. The opening incident of the game was a rather unfortunate clash of heads between Kyle Jacobs, and Christian Nade, and although the game was halted for a few minutes, thankfully both players were able to continue. Queens early attacking play was all going down the right side of the pitch and heavily involved Murdoch, and it was his run and cross that almost created a shooting opportunity for Derek Lyle, but his pass across to Lyle was just behind him and the chance had gone.That came after just 3 minutes but in their next attack, Queens should really have taken the lead. A long ball from Darren Brownlie beat the Dumbarton defence and found Dale Hilson who had managed to stay onside. His perfect cross picked out Alex Harris who had joined the attack, but with the goal at his mercy he scuffed his shot and although the ball struck the post and rolled along the line it never went over it. The visitors were really struggling to gain any meaningful possession of the ball, and it took them 10 minutes to get anywhere near the Queens penalty area, and when they did - after winning a free-kick for a foul by Brownlie - their header from the set-piece flew well over Robbie Thomson`s crossbar. There was plenty of pace about the Queens attack, and with Oliver,Hilson, and Harris linking well,chances were coming thick and fast.The hosts won their first corner after Tapping picked out Hilson and the striker did well to gain the set-piece holding the ball up before playing it off the covering defender.The initial delivery from Harris wasn`t too good, but when the ball was worked back out to him, his next attempt at a cross was well executed and was only inches away from being met by the head of either Lyle or Higgins. Queens maintained the pressure and went close again following their next attack.Chris Higgins began the move deep in his own half and as the ball was worked out to Oliver via Kyle Hutton, Hilson came really close to connecting with Oliver`s well placed cross. At that stage with 20 minutes played, there was just a slight suggestion that it was going to maybe be one of those days. 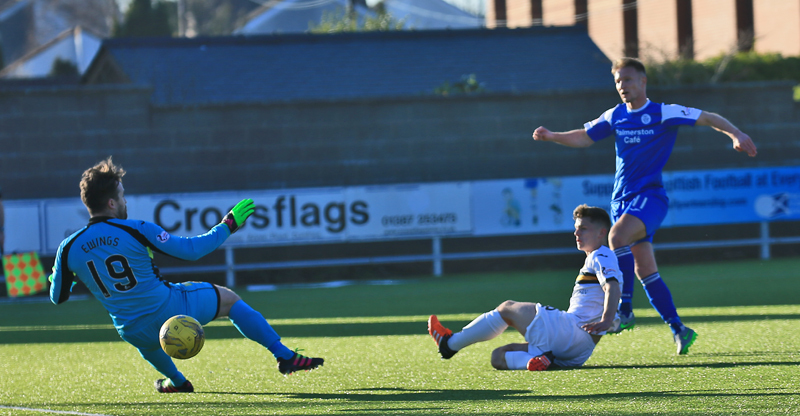 Queens were well on top, but as yet, Ewings in the Dumbarton goal had not been forced into making any form of save, and it continued that way as the home side created, and wasted more chances. Harris, and Hilson exchanged passes before Hilson shot wide, and then a run and shot from Oliver ended halfway up the Portland Drive terracing, and on the half hour mark another half chance for Hilson came and went when the striker dragged his shot wide of the target. The Queens central pairing of Hutton and Tapping were dominating midfield, and Tapping`s use of the ball at times was very encouraging, and his delightful pass over the top of the Dumbarton defence picked out the run of Harris, but he wasn`t able to replicate the pass he received as his cross was disappointing.However, moments later Harris was able to put things right.On 34 minutes,Queens went ahead.Having won Queens their second corner of the game, Harris` delivery was cleared out as far as Oliver who in turn played the ball back to Harris,and his whipped in cross was met by a glancing header from Higgins that was deflected away for yet another corner.This time Harris` floated delivery was met by defender Darren Brownlie who rose well to plant a firm header past `keeper Ewings to score his first ever Queens goal. Queens certainly deserved to be ahead and they might have doubled their lead moments later when Lyle was on the end of a flowing move, but couldn`t keep his shot from the edge of the area on target. 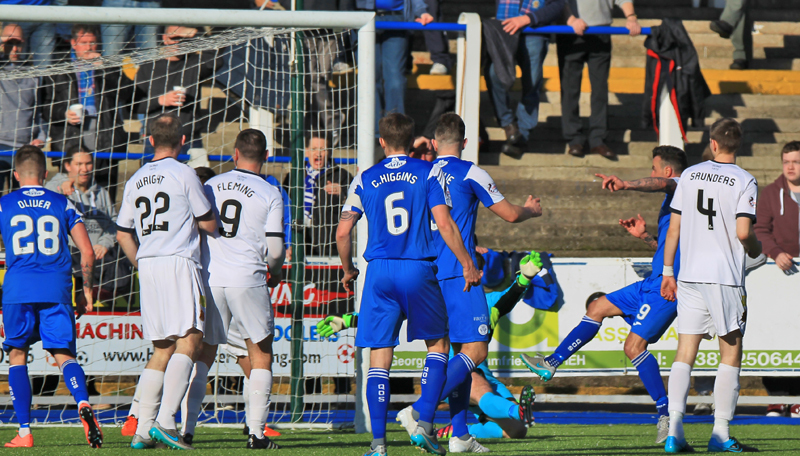 Dumbarton`s only real goal attempt came following a foul on Cawley by Kyle Jacobs. Calum Waters lined up the free-kick, and he was unlucky to see his shot clear the ball but bounce just wide of the near upright.Had that chance been taken, then the game might have been different as almost straight after that, Queens extended their advantage.Two minutes before the interval Calum Tapping led a Queens break with a surging run through the middle of the park and with a supporting run from Harris on his right,that was the pass, and although his cross was blocked away for a corner, the home support in the crowd of 1459 were only seconds away from cheering another goal.Harris and Oliver worked a short corner and when Harris` ball into a packed penalty box caused panic,Derek Lyle was on hand to turn and lift the ball high into the net from close range, to score for the 12th time this season. The goal was also Lyle`s 90th goal for the club and after being off of the scoresheet since Dumbarton knocked Queens out of the cup in January, he wouldn`t have long to wait for goal number ninety-one. The visitors made 2 changes at the break as Walsh and Gallagher replaced Kirkpatrick and Buchanan, but in all honesty it made little difference as Queens continued to dominate the game.Quite bizarrely, rather like the first half, the opening incident was once again a clash of heads only this time it was two Queens players -Brownlie and Tapping- who were involved, and although Tapping was able to continue, Brownlie needed further treatment and was led from the field.During his absence, about 4 minutes, Dumbarton would probably have expected to put Queens under pressure, but quite the reverse happened as Queens scored again.Chris Higgins was again instrumental in the build up as it was his interception and pass that set Harris racing clear. With Oliver in support to his left, Harris slipped a perfect pass inside to Oliver and although he took a heavy touch and appeared to lose control as the `keeper rushed to meet him, the ball ran nicely into the path of Derek Lyle who guided the ball into the open goal from 6-yards out. With Darren Brownlie fit to resume and the confidence flowing through the entire team, the home fans were treated to some fine attacking play from their favourites with some of the football produced by Queens being easily the best that has been seen this season. Every player wanted, and looked good in possession, and although Dumbarton - even at this stage - looked a beaten side, Queens went in search of more goals.The only yellow card of the game was shown to Dumbarton`s Gallagher just before Queens, and in particular, Derek Lyle, thought they had scored again. Brownlie fed Oliver and his pace took him beyond the defence before picking out a well measured cross for Lyle, but as the Queens striker connected with the ball it bounced onto his hand and although he finished well, the goal was rightly chalked off for handball. The injury to Darren Brownlie was obviously causing him problems, and once again he had to leave the game, and amazingly,yet again Queens made light of his absence and scored for the fourth time.Good work from Murdoch, and the very impressive Oliver created a shooting opportunity for Alex Harris and his low shot was deflected past Ewings and just inside the post to give Queens a very comfortable lead.Queens made their first change when Iain Russell replaced Dale Hilson after 72 minutes, and just a minute later, Queens struck goal number 5. A burst of speed from Gary Oliver opened up the Dumbarton defence and a well weighted and perfectly placed pass allowed Alex Harris the chance to slide the ball past Ewings to score his second goal of the game. Mark Millar replaced Calum Tapping after 78 minutes, and he came very close to adding his name to the list of scorers but his low drive - with the `keeper beaten - was cleared off the line by Wright. 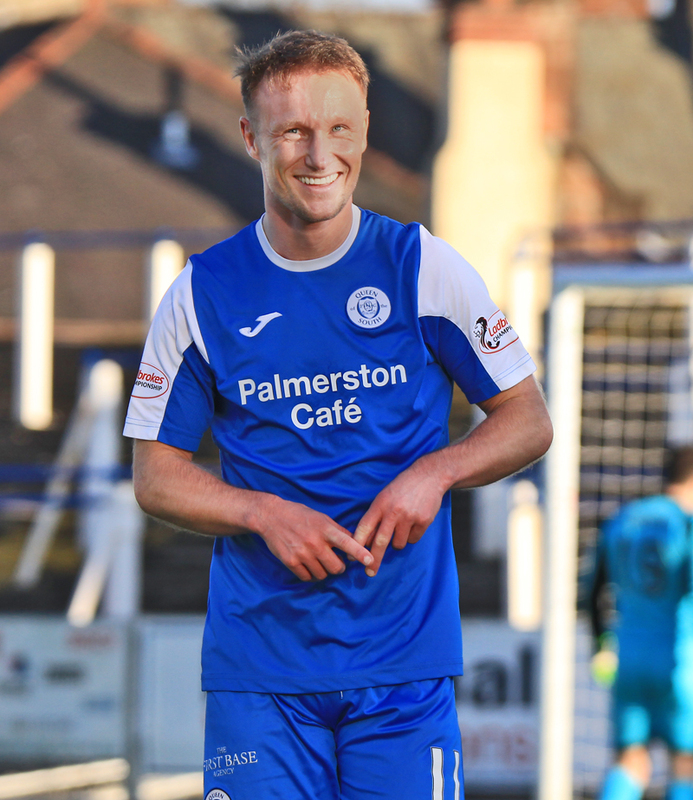 Queens final change saw Ryan Conroy replace 2 goal striker, Derek Lyle who nearly had the chance to complete his hat-trick minutes earlier, but he couldn`t react quick enough to anticipate a pass from Kyle Hutton. Dumbarton then brought on substitute Paul Heffernan, and the man who scored the winning goal the last time the sides met at Palmerston nearly scored a consolation goal with a fine effort, but Robbie Thomson pulled off a decent save to keep the ball out, although in the end it all counted for nothing as Heffernan had been flagged for offside. 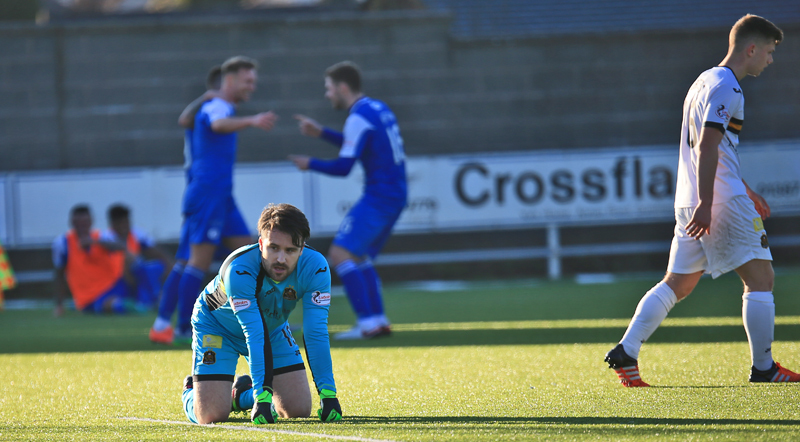 In truth that was the only save that Thomson had to make as he enjoyed one of his more easy afternoon`s as Queens goalkeeper on the way to clean sheet number 10 for the season. With two minutes left Iain Russell completed the scoring as he got on the end of a fine flowing move to beat Ewings with a well placed shot, and he very nearly scored again right at the death, but his lob from a difficult angle fell just wide.So it finished with Queens netting just the six, a perfect way to end what has been a disappointing week, and who knows, maybe the Play-Off spot is still reachable. Alex Harris was chosen as man-of-the-match and it must have been close as there were many candidates for the award today.Seven games to go, twenty-one points up for grabs, a tall order but if Queens can play like they did today, then who knows?? 15:22 Queens are out warming up ahead of today`s game vs Dumbarton. Team line-ups to follow. 15:41 Dumbarton; Ewings, Saunders, Buchanan, Cawley, Fleming, Kirkpatrick, Barr, Waters, Lindsay, Wright, Nade. 5 min Early chance for Queens, Harris scuffs his shot from five-yards and clips the post. 13 min Hutton sprays the ball to Harris who knocks the ball into the box but Lyle can`t reach the cross. Still 0-0. 21 min Oliver skilfully gets past his marker and lines up a strike 25-yards out but goes over the bar. 24 min Harris finds Hilson but the strikers tame effort drifts wide. 29 min Lyle heads to Hilson, the strikers turns but his strike is straight at Ewings. 34 min Brownlie heads home from close range to give The Doonhamers a well deserved lead. 1-0. 35 min Lyle tries his luck from long range but scoops his shot over the bar. 43 min After a scramble in the box, Lyle fires into the back of the net to double Queens` advantage. 70 min Harris` shot is deflected into the back of the net. 4-0 Queens. 80 min Millar`s shot cleared off the line by Wright. 90 min Russell finishes off a superb move to make it 6-0.